James Graham-Cloete at Ocean Independence is offering the 44.68m motor yacht Berzinc for charter in the Caribbean this winter. Fresh from a 2012 refit, she offers accommodation for up to 12 guests in three double and two twin staterooms plus two Pullman berths and carries a full complement of water toys. 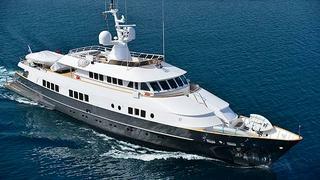 Based is St Maarten, her owner will consider charters in other locations. Berzinc is available at weekly rates from $110,000 in high season and $95,000 in low season.